Coordinates: 45°N 124°W﻿ / ﻿45°N 124°W﻿ / 45; -124 The Cascadia subduction zone (also referred to as the Cascadia fault) is a convergent plate boundary that stretches from northern Vancouver Island in Canada to Northern California in the United States. It is a very long, sloping subduction zone where the Explorer, Juan de Fuca, and Gorda plates move to the east and slide below the much larger mostly continental North American Plate. The zone varies in width and lies offshore beginning near Cape Mendocino Northern California, passing through Oregon and Washington, and terminating at about Vancouver Island in British Columbia. 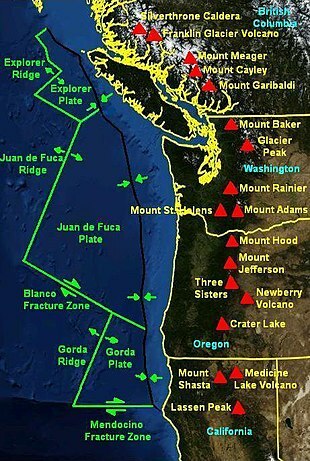 The Explorer, Juan de Fuca, and Gorda plates are some of the remnants of the vast ancient Farallon Plate which is now mostly subducted under the North American Plate. The North American Plate itself is moving slowly in a generally southwest direction, sliding over the smaller plates as well as the huge oceanic Pacific Plate (which is moving in a northwest direction) in other locations such as the San Andreas Fault in central and southern California. Tectonic processes active in the Cascadia subduction zone region include accretion, subduction, deep earthquakes, and active volcanism of the Cascades. This volcanism has included such notable eruptions as Mount Mazama (Crater Lake) about 7,500 years ago, the Mount Meager massif (Bridge River Vent) about 2,350 years ago, and Mount St. Helens in 1980. 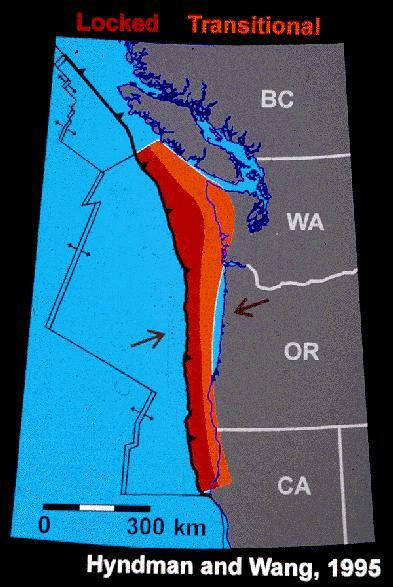 Major cities affected by a disturbance in this subduction zone include Vancouver and Victoria, British Columbia; Seattle, Washington; and Portland, Oregon. There are no contemporaneous written records of the 1700 Cascadia earthquake. Orally transmitted legends from the Olympic Peninsula area tell of an epic battle between a thunderbird and a whale. In 2005, seismologist Ruth Ludwin set out to collect and analyze anecdotes from various First Nations groups. Reports from the Huu-ay-aht, Makah, Hoh, Quileute, Yurok, and Duwamish peoples referred to earthquakes and saltwater floods. This collection of data allowed the researchers to come up with an estimated date range for the event; the midpoint was in the year 1701. During low tide one day in March 1986, paleogeologist Brian Atwater dug along Neah Bay with a nejiri gama, a small hand hoe. Under a top layer of sand, he uncovered a distinct plant—arrowgrass—that had grown in a layer of marsh soil. This finding was evidence that the ground had suddenly sunk under sea level, causing saltwater to kill the vegetation. The event had happened so quickly that the top layer of sand sealed away the air, thus preserving centuries-old plants. In 1987, Atwater mounted another expedition paddling up the Copalis River with Dr. David Yamaguchi, who was then studying the eruptions of Mount St. Helens. The pair happened upon a section of "ghost forest," so-called due to the dead, gray stumps left standing after a sudden inundation of salt water had killed them hundreds of years ago. Originally thought to have died slowly due to a gradual rise in sea level, closer inspection yielded a different story: the land plummeted up to two meters during an earthquake. Having initially tested spruce using tree-ring dating, they found that the stumps were too rotted to count all the outer rings. However, upon having examined those of the western red cedar and comparing them to the living specimens meters away from the banks, they were able to approximate their year of death. There were rings up until the year 1699, indicating that the incident had occurred shortly thereafter. Root samples confirmed their conclusion, narrowing the time frame to the winter of 1699 to 1700. As with the arrowgrass site, the banks of the Copalis River are lined with a layer of marsh followed by a layer of sand. Jody Bourgeois and her team went on to demonstrate that the sand cover had originated with a tsunami surge rather than a storm surge. In 1995, an international team led by Alan Nelson of the USGS further corroborated these findings with 85 new samples from the rest of the Pacific Northwest. All along British Columbia, Washington State, and Oregon, the coast had fallen due to a violent earthquake and been covered by sand from the subsequent tsunami. A further ghost forest was identified by Gordon Jacoby, a dendrochronologist from Columbia University, 60 feet (18 m) underwater in Lake Washington. Unlike the other trees, these suffered from a landslide rather than a dip in the fault during a separate event around 900 CE. In the 1960s, underground fractures were uncovered by oil companies in Puget Sound. These were believed to be inactive through the 1990s. 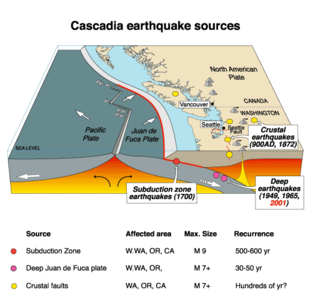 In the 1980s, geophysicists Tom Heaton and Hiroo Kanamori of Caltech compared the generally quiet Cascadia to more active subduction zones elsewhere in the Ring of Fire. They found similarities to faults in Chile, Alaska, and Japan's Nankai Trough, locations known for megathrust earthquakes, a conclusion that was met with skepticism from other geophysicists at the time. A 1996 study published by seismologist Kenji Satake supplemented the research by Atwater et al. with tsunami evidence across the Pacific. Japanese annals, which have recorded natural disasters since approximately 600 CE, had reports of a sixteen-foot tsunami that struck the coast of Honshu Island during the Genroku. Since no earthquake had been observed to produce it, scholars dubbed it an "orphan tsunami." Translating the Japanese calendar, Satake found the incident had taken place around midnight of 27–28 January 1700, ten hours after the earthquake occurred. The original magnitude 9.0 earthquake in the Pacific Northwest had thus occurred around 9pm local time on 26 January 1700. The Cascadia Subduction Zone (CSZ) is a 1,000 km (620 mi) long dipping fault that stretches from Northern Vancouver Island to Cape Mendocino in northern California. It separates the Juan de Fuca and North America plates. 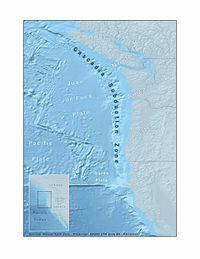 New Juan de Fuca plate is created offshore along the Juan de Fuca Ridge. The Juan de Fuca plate moves toward, and eventually is shoved beneath, the continent (North American plate). The zone separates the Juan de Fuca Plate, Explorer Plate, Gorda Plate, and North American Plate. Here, the oceanic crust of the Pacific Ocean has been sinking beneath the continent for about 200 million years, and currently does so at a rate of approximately 40 mm/yr. At depths shallower than 30 km (19 mi) or so, the Cascadia zone is locked by friction while strain slowly builds up as the subduction forces act, until the fault's frictional strength is exceeded and the rocks slip past each other along the fault in a megathrust earthquake. Below 30 km (19 mi) the plate interface exhibits episodic tremor and slip. The width of the Cascadia subduction zone varies along its length, depending on the angle of the subducted oceanic plate, which heats up as it is pushed deeper beneath the continent. As the edge of the plate sinks and becomes hotter and more molten, the subducting rock eventually loses the ability to store mechanical stress; earthquakes may result. On the Hyndman and Wang diagram (not shown, click on reference link below) the "locked" zone is storing up energy for an earthquake, and the "transition" zone, although somewhat plastic, could probably rupture. The Cascadia subduction zone runs from triple junctions at its north and south ends. To the north, just below Haida Gwaii, it intersects the Queen Charlotte Fault and the Explorer Ridge. To the south, just off of Cape Mendocino in California, it intersects the San Andreas Fault and the Mendocino Fracture Zone at the Mendocino Triple Junction. Megathrust earthquakes are the most powerful earthquakes known to occur, and can exceed magnitude 9.0. They occur when enough energy (stress) has accumulated in the "locked" zone of the fault to cause a rupture known as a megathrust earthquake. The magnitude of a megathrust earthquake is proportional to length of the rupture along the fault. The Cascadia Subduction Zone, which forms the boundary between the Juan de Fuca and North American plates, is a very long sloping fault that stretches from mid-Vancouver Island to Northern California. Because of the great length of the fault, the Cascadia Subduction Zone is capable of producing very large earthquakes if rupture occurs along its entire length. Thermal and deformation studies indicate that the region 60 kilometers (about 40 miles) downdip (east) of the deformation front (where plate deformation begins) is fully locked (the plates do not move past each other). Further downdip, there is a transition from fully locked to aseismic sliding. In 1999, a group of Continuous Global Positioning System sites registered a brief reversal of motion of approximately 2 centimeters (0.8 inches) over a 50 kilometer by 300 kilometer (about 30 mile by 200 mile) area. The movement was the equivalent of a 6.7 magnitude earthquake. The motion did not trigger an earthquake and was only detectable as silent, non-earthquake seismic signatures. In 2004, a study conducted by the Geological Society of America analyzed the potential for land subsidence along the Cascadia subduction zone. It postulated that several towns and cities on the west coast of Vancouver Island, such as Tofino and Ucluelet, are at risk for a sudden, earthquake initiated, 1–2 m subsidence. The last known great earthquake in the northwest was the 1700 Cascadia earthquake. Geological evidence indicates that great earthquakes (> magnitude 8.0) may have occurred sporadically at least seven times in the last 3,500 years, suggesting a return time of about 500 years. Seafloor core evidence indicates that there have been forty-one subduction zone earthquakes on the Cascadia subduction zone in the past 10,000 years, suggesting a general average earthquake recurrence interval of only 243 years. Of these 41, nineteen have produced a "full margin rupture," wherein the entire fault opens up. By comparison, similar subduction zones in the world usually have such earthquakes every 100 to 200 years; the longer interval here may indicate unusually large stress buildup and subsequent unusually large earthquake slip. The next rupture of the Cascadia Subduction Zone is anticipated to be capable of causing widespread destruction throughout the Pacific Northwest. Prior to the 1980s, scientists thought that the subduction zone did not generate earthquakes like other subduction zones around the world, but research by Brian Atwater and Kenji Satake tied together evidence of a large tsunami on the Washington coast with documentation of an orphan tsunami in Japan (a tsunami without an associated earthquake). The two pieces of the puzzle were linked, and they then realized that the subduction zone was more hazardous than previously suggested. In 2009, some geologists predicted a 10% to 14% probability that the Cascadia Subduction Zone will produce an event of magnitude 9.0 or higher in the next 50 years. In 2010, studies suggested that the risk could be as high as 37% for earthquakes of magnitude 8.0 or higher. Geologists and civil engineers have broadly determined that the Pacific Northwest region is not well prepared for such a colossal earthquake. The earthquake is expected to be similar to the 2011 Tōhoku earthquake and tsunami, because the rupture is expected to be as long as the 2004 Indian Ocean earthquake and tsunami. The resulting tsunami might reach heights of approximately 30 meters (100 ft). FEMA estimates some 13,000 fatalities from such an event, with another 27,000 injured. It predicts that a million people will be displaced, with yet another 2.5 million requiring food and water. An estimated 1/3 of public safety workers will not respond to the disaster due to a collapse in infrastructure and a desire to ensure the safety of themselves and their loved ones. Other analyses predict that even a magnitude 6.7 earthquake in Seattle would result in 7,700 dead and injured, $33 billion in damages, 39,000 buildings largely or totally destroyed, and 130 simultaneous fires. The most active volcanoes in the chain include Mount St. Helens, Mt. Baker, Lassen Peak, and Mt. Hood. St. Helens captured worldwide attention when it erupted catastrophically in 1980. St. Helens continues to rumble, albeit more quietly, emitting occasional steam plumes and experiencing small earthquakes, both signs of continuing magmatic activity. Most of the volcanoes have a main, central vent from which the most recent eruptions have occurred. The peaks are composed of layers of solidified andesitic to dacitic magma, and the more siliceous (and explosive) rhyolite. ^ a b c d e f g Schulz, Kathryn (July 20, 2015). "The Really Big One: An earthquake will destroy a sizable portion of the coastal Northwest. The question is when". The New Yorker. Retrieved July 14, 2015. ^ a b c d e f g Stefan Lovgren (8 December 2003). "Did North American Quake Cause 1700 Japanese Tsunami?". National Geographic. Retrieved 15 July 2015. ^ a b c d e f "Ghosts of Tsunamis Past". American Museum of Natural History. Retrieved 15 July 2015. ^ a b c d e f Kevin Krajick (March 2005). "Future Shocks: Modern science, ancient catastrophes and the endless quest to predict earthquakes". Smithsonian Magazine. Retrieved 15 July 2015. ^ a b c d e f g h Jerry Thompson (13 March 2012). "The Giant, Underestimated Earthquake Threat to North America". Discover Magazine. Retrieved 15 July 2015. ^ a b Alt, David D.; Hyndman, Donald W. (1978). Roadside Geology of Oregon (19th ed.). Missoula, Montana: Mountain Press. p. 3. ISBN 978-0-87842-063-6. ^ "Hyndman and Wang". Archived from the original on 2010-05-30. Retrieved 2009-12-17. USGS (dead link) See fig. 5 here for the diagram. ^ a b Nedimović, Mladen R.; Hyndman, Roy D.; Ramachandran, Kumar; Spence, George D. (24 July 2003). "Reflection signature of seismic and aseismic slip on the northern Cascadia subduction interface". Nature. 424 (6947): 416–420. Bibcode:2003Natur.424..416N. doi:10.1038/nature01840. PMID 12879067. ^ Dragert, Herb; Wang, Kelin; James, Thomas S. (25 May 2001). "A silent slip event on the deeper Cascadia subduction interface". Science. 292 (5521): 1525–1528. Bibcode:2001Sci...292.1525D. doi:10.1126/science.1060152. PMID 11313500. ^ Rogers, Garry; Dragert, Herb (20 June 2003). "Episodic tremor and slip on the Cascadia subduction zone: the chatter of silent slip". Science. 300 (5627): 1942–1943. Bibcode:2003Sci...300.1942R. doi:10.1126/science.1084783. PMID 12738870. ^ Brian F Atwater; Musumi-Rokkaku Satoko; Satake Kenji; Tsuji Yoshinobu; Ueda Kazue; David K Yamaguchi (2005). The Orphan Tsunami of 1700 — Japanese Clues to a Parent Earthquake in North America (PDF) (U.S. Geological Survey Professional Paper 1707 ed.). Seattle and London: University of Washington Press. p. 100 (timeline diagram). ISBN 978-0-295-98535-0. ^ Brian F Atwater; Martitia P Tuttle; Eugene S Schweig; Charles M Rubin; David K Yamaguchi; Eileen Hemphill-Haley (2003). Earthquake Recurrence Inferred from Paleoseismology (PDF). Developments in Quaternary Science. Developments in Quaternary Sciences. 1. Elsevier BV. Figures 10 and 11 (pp 341, 342); article pp 331–350. doi:10.1016/S1571-0866(03)01015-7. ISBN 9780444514707. ISSN 1571-0866. Archived from the original (PDF) on 2012-03-19. Retrieved 2011-03-15. ^ "Cascadia Subduction Zone". Pacific Northwest Seismic Network. ^ "Cascade Range Earthquake Workgroup – Magnitude 9 scenario" (PDF). ^ a b Tobias, Lori (April 19, 2009). "Big earthquake coming sooner than we thought, Oregon geologist says". The Oregonian. ^ Lovett, Richard A. (31 May 2010). "Risk of giant quake off American west coast goes up". Nature. doi:10.1038/news.2010.270. Retrieved 2010-06-08. Chris Goldfinger; C. Hans Nelson; Ann E. Morey; Joel E. Johnson; Jason R. Patton; Eugene Karabanov; Julia Gutiérrez-Pastor; Andrew T. Eriksson; Eulàlia Gràcia; Gita Dunhill; Randolph J. Enkin; Audrey Dallimore; Tracy Vallier (2012). Robert Kayen (ed.). "Turbidite event history—Methods and implications for Holocene paleoseismicity of the Cascadia subduction zone". U.S. Geological Survey. Professional Paper 1661–F. Atwater, BF (1987). "Evidence for great Holocene earthquakes along the outer coast of Washington State". Science. 236 (4804): 942–44. Bibcode:1987Sci...236..942A. CiteSeerX 10.1.1.175.8056. doi:10.1126/science.236.4804.942. PMID 17812748.